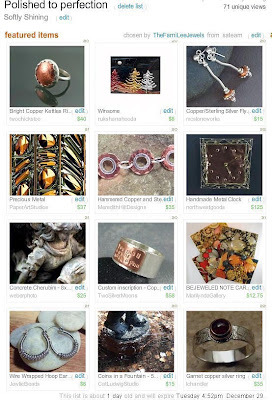 The FamiLee Jewels: Have you ever made an Etsy Treasury? 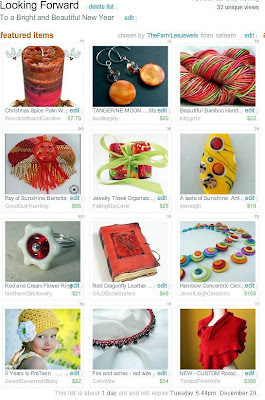 Etsy treasuries are collections of items that are offered in etsy stores. They are curated by members and each lasts for 2 or 3 days. They are curated by members who make them for many different reasons. still others as a thank you to customers. I like to make them as works of art. It is fun to come up with an idea and then to build a color scheme of items to express that idea visually. They are like tiny little quilts, where seemingly disparate elements come together to express a whole idea beautifully. The FamiLee Jewels currently have 2 treasuries curated. Polished to perfection was made to express my appreciation of glowing patinas. Some have been created by hand and some have been polished by nature but they are all lovely. Looking Forward, which appears at the top of the page, expresses my delight in a brand new year. It is full of hope and bright thoughts for a fabulous 2010.